To place your order, simply select the item you'd like below, then select your size and color choices. To add additional items, simply return to your cart and repeat the process. VOILA! NEW! 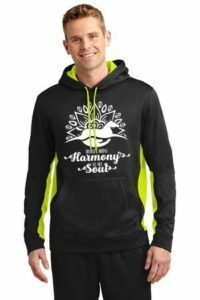 Harmony Stables Logo Apparel now available to order! Hoodie Sweatshirts – lightweight but warm, easy to launder and horse/pet hair just brushes away! Full-Zip Jackets – Moisture wicking, soft-brushed jacket with contrast colors. Super sharp looking! T-shirts – lightweight, comfy cotton t-shirts. Cute enough to wear around town, comfy enough to wear as jammies! All full zip jackets will come with the traditional Harmony Stables logo. All hoodies and t-shirts will come with the new “Horses Bring Harmony to my Soul” mandala logo. Orders will be placed every 2-4 weeks – please allow ample time for ordering. Free local pickup available only – no shipping at the current time.